Coming from the bicycling mecca of Portland, Oregon, Angela Koch knows a thing or two about spokes and wheels. But her interest isn't in how to fix a derailleur gear or change a flat tire. Koch's passion is in educating people about the joy of choosing two wheels for fun and commuting. That's why we in the D.C. area are lucky to have nabbed her from Portland. Koch is currently the Events & Advocacy Coordinator at popular bike shop Revolution Cycles. She recently took time out of her busy schedule for an email Q&A with Green D.C.
Green D.C.: How did you first get involved in bicycle advocacy? Angela Koch: I've lived car-free or car-lite for the past 15 years so bikes as a solution to a lot of problems has always been one of my interests. In 2007, I got a job with the Bicycle Transportation Alliance, a highly respected and effective statewide bike advocacy organization in Oregon. My title was Safe Routes to School Director, but my youngest daughter at the time (who was then 3) used to call me The President of Bicycling For Kids. I always thought of myself as just a programs person with a stronger interest in improving children's lives, but after three years in such a fantastic place, I couldn't help but evolve into a confident bike advocate. GDC: You come from a city and state -- Portland, Oregon -- that has made great strides over the years in cultivating a bicycle culture and creating a biking infrastructure. Why did you decide to move to the Washington, D.C. area and how would you compare where this area is now compared to a place like Portland? AK: My two motivating factors to move here were personal- moving to be closer to family- and professional- I found an amazing job with Revolution Cycles. They're doing cutting edge work as a retailer by taking on bike advocacy so directly and I wanted to be a part of that. Comparing this area to Portland is a bit of an apples and oranges dance. Both areas are enjoying the benefits of the work of individuals and organizations that have been chipping away for years at improving infrastructure and changing policy in order to improve conditions for biking. Both areas also enjoy the benefits of very passionate people and groups who are working tirelessly to be innovative and thorough in their efforts. The differences, I think, have more to do with the regional differences than with an attitude toward biking. In Portland, there are fewer jurisdictions that have to coordinate with each other, lower cost of living and housing costs that are better poised to support creating livable communities and an historically forward-thinking approach to planning and policy that supports sustainable initiatives such as biking. The biggest difference is mode split; Portland has a super high mode split for bikes. DC is just plain bigger: there are three DOTs, federal land and security issues, trails managed by National Parks and a much larger metropolitan area that makes for a much larger ship to turn around when it comes to livability issues. The DC area is also a much more transitory place with people coming and going all the time so I imagine that affects our ability to make behavior change messages really stick. But, places like Arlington County are leading the way and are definitely very 'Portland' in their approach and the recent big changes in DC (bike boxes, contraflow lanes, bike lights) are incredibly exciting and right up there with Portland. GDC: What is the biggest challenge you find in bike advocacy at the moment? AK: Oh, don't hate me, but I think the biggest challenge has to do with the behavior of all road users and the tendency to lob grenades at each other from our respective bunkers. Seriously, every day I see people behaving badly - cyclists, drivers, pedestrians - and that makes it challenging to focus on the real issues of safety, livability, congestion mitigation, etc. It's kind of sad how quickly a thoughtful dialogue can deteriorate when you get thrown off track by individual stories of the time I saw a fill-in-the-blank do something stupid. My point of view? There are dummies out there but we shouldn't let them control the public discourse over an issue that's so vital to our community. GDC: Do you have a particular success story you'd like to share in your work as a bicycle advocate? AK: There are some really personal individual stories that warm my heart, but the most recent one really got me thinking about the bigger picture and the paradigm shift we're working toward. I just did a Ladies' Night event with the Georgetown GM, Katie Knight, in our store in Stafford. We had an awesome turnout and Katie and I had a blast talking to the group about how to ride, where to ride and why it's important that more women ride their bikes. Afterward, folks were mingling about and one lady pulled me aside. I was expecting a question about chamois cream or something embarrassing based on her hushed voice. Instead, she wanted to know about my life as a car-free mom of three. She shared that she's wanted to go car-free for a few years now and is trying to convince her husband. They're a military family, just moved here, and had hoped to get a place on the base so they could make the shift to car-free living. But they didn't, and she was bummed but still hopeful. I was struck by how shy she was about the conversation, as if she was admitting to a deep, dark secret. It was exciting to help her understand that there's no need to be so hard on herself, that what's important is to at least be thinking about it. Shifting your mindset to a less car-centric one is a great first step. GDC: In a recent blog post titled "Be the Change" on the website CommuterPageBlog, you recap a recent family errands/shopping trip you took for your two kids by bicycle. It looks like it was a challenging but ultimately rewarding experience. When I was living in Los Angeles I would ask people why they drove instead of walking, biking or taking public transportation, and they would always say that they don't want to drive but their jobs (many of them were actors with portable wardrobes) require them to because they have to travel to multiple areas of L.A. in a single day with all their stuff. Your story is proof that it can be done without a car. What would you say to the car-free skeptics out there? AK: I'd say what my step-dad used to say to me all the time growing up, "Can't never could." Again, it's a mindset. If you're creative enough and diligent enough, there's a solution out there to just about everything. The only thing holding you back is your own fear or skepticism and who wants to live life that way?! GDC: Are there any interesting projects you are currently working on to make Arlington and Greater Washington a more bike-friendly community? AK: From big picture to small picture, we're collecting signatures for the People For Bikes campaign that Bikes Belong is leading. This is a campaign to get 1 million people to sign in support of bikes so that when transportation funding is on the table at the federal level, advocates can honestly say they represent the wishes of 1 million people who want more transportation dollars allocated to bike projects. I'd love for people to come into any one of our stores and sign your name. It's that simple. We're leading Hub Spin rides and hosting or collaborating on other fun events with partners to encourage as many people as possible to bike for the fun of it. On August 27, I'm leading a Hub Spin to a Nationals game, September 18 we're doing a bike scavenger hunt in Crystal City, and September 26 I'm leading a Progressive Dinner Hub Spin to Zaytanya, Oyumel and Jaleo. Also, on International Car-Free Day, September 22, our Clarendon store is hosting an event for local business leaders to learn more about the Arlington Transportation Partners' Car-Free Diet. I'm also hoping to take our Ladies' Night events and grow those into a series suitable to different demographics and experience levels to share information and resources about bike safety, maintenance and advocacy. There are some specifics brewing, but you'll just have to stay tuned a bit for that. And on a more micro level, I'm attending the Arlington and Rockville Bike Advisory Committee meetings and I'd like to get connected to the DC Bicycle Advisory Council meetings as well. We're starting to do research in the Stafford area to see how we can effect change down there. In addition, I've initiated our own Revolution Cycles Advocacy Committee in order to educate and energize our own staff to get more involved in bike advocacy work. GDC: What advice do you have for both drivers and pedestrians in terms of sharing the road? AK: Drivers: SLOW DOWN. Traffic calming is one of the best ways to reduce the number and severity of crashes. Wouldn't it be great if we didn't have to spend as much money on traffic calming treatments because everyone just naturally slowed down? Pedestrians: Look both ways, make eye contact and cross where and when you're supposed to. It's pretty much the same for all road users: be smart and follow the law. 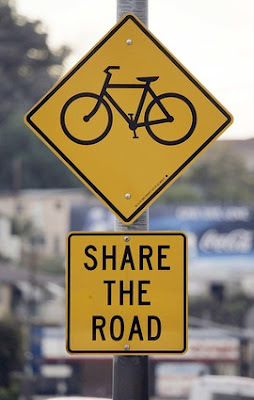 Mostly, all road users should try and remove labels and remember that we're all people just trying to get somewhere. GDC: What can we learn from other places around the world in our transition to a multi-modal transportation system with spokes and wheels a part of the solution? Cities like Amsterdam and Copenhagen seem like model bike-friendly areas that are able to share a lot of best practices with us. AK: First and foremost, funding parity is critical in order to build the infrastructure necessary to support safe multi-modal transportation. What that means is that at the very least, we should spend the same percentage of transportation dollars on bikes as the percentage of trips made by bikes. It's a super simple concept that will leverage tremendous change that benefits entire communities and regions for a pretty small investment. Next, get more people to ride bikes so that everyone is safer. It's a fact that as bike trip numbers rise, safety increases. And who should those people be? Women, families, grandma and grandpa - mainstream people using their bikes to get around and get life's work done and enjoy themselves while they're at it. GDC: What are your thoughts on bike sharing, and particularly the new Capital BikeShare that is launching in September? AK: I am so in love with bike share it's not even funny. Seriously, Revolution Cycles is a founding member of Capital BikeShare because it's going to get more butts on bikes, as we like to say. Anything communities can do to make cycling convenient and accessible is a step in the right direction and that is flat out what Capital BikeShare is doing. Thanks in a big way to all the electeds who supported it and made it happen. GDC: Any other thoughts you'd like to share about bicycle advocacy in our Nation's Capital? AK: This area is uniquely poised to make a tremendous difference because of the proximity to policy makers and power. I'm convinced that the more this region can model (flaunt?!) bikes as a viable form of transportation for a significant portion of the population, we'll reach a tipping point and it will be impossible for skeptics to continue to debate what I think is a total no-brainer issue. This is vital, exciting work and I'm glad to be a part of it!